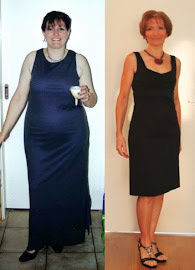 FitBody Fifty: I made it! I got through the run, sore throat and all. Luckily my back decided to be nice and I woke up this morning almost free of pain. One less thing to worry about. My carefully laid plans worked out exactly - I know the stupid trains don't start running on Sundays until too late to get to the event, so I was up at 5:45, and out the door by 6:15 to drive to the city. It's a dream run at that hour on a Sunday.... I also knew Fed Square's car park didn't open till 8:00 (thank you, Internet! ), so I headed straight for the Arts Centre, which has a 24-hour car park. From there, I just had to cross St Kilda Rd and I was at the muster area, ready to rock and roll by shortly after 7:00. Race time 7:45 - perfect! I met my sister and my niece and we did the whole warm-up aerobics thing (I usually skip that), then headed off to the starting line..... well, several hundred metres back from the starting line, actually. There are SO many people turning out for this event now - which is fantastic, all those fundraising dollars, not to mention increased awareness and so on. But they were in MY way! So of course, when the starting siren sounded, we waited...and waited...and then shuffled forward...stopped...shuffled a bit more...and finally started an excruciatingly slow jog. I left my sister for dead and started dodging between people, and my little niece stuck to me like glue. She paced me the whole way. She even got a stitch and I told her to walk, don't worry about keeping up with me. But she'd walk for 30 seconds, then sprint to catch me again. LOL. I suspect she could have quite easily beaten me if she'd really tried. As usual, the first kilometre was spent having a mental argument with myself. The old I-can't-do-this/Yes-you-can-and-you-WILL deal. Of course, by the time I ran past the 1km sign, I was feeling fine. I made it across the finish line and felt pretty good. As for my time...uh...small problem there. I had so many things on my mind at the start, that I completely forgot to press 'start' on my heart rate monitor (can you say "S.T.O.O.P.I.D."?) as I crossed the timing mats. I remembered a short time later, but I have no idea exactly how long that was. So I have two times, one from my HRM (24:something) and one from the clock at the finish line (26:something). My true time lies somewhere in between, so I'll have to wait for the official times to be posted before I know how I did. Hey, at least I remembered to wear my HRM. I was almost asleep last night when I remembered it, and jumped out of bed to rummage in my gym bag for it so I wouldn't forget it this morning. Whatever my time was, I'm happy to have gotten through it, considering how crap I was feeling last night, and what a battle it was getting around ALL THOSE SLOW PEOPLE. And it really was a great event, if a little emotional. We waited for my sister at the finish line - she crossed at the official time of 33:something (probably more like 31 or 32), so that was a great effort for a non-runner who was having her first go at a fun run. She was stoked. Then we collected our medallions and showbags and headed over to Southgate for coffee. I got home to be smothered with hugs and loaded up with presents (yay!). An iPod shuffle and accessories, plus a CD I wanted. :o) Then a lovely hot shower - bliss! Then it was out for lunch with my Mum and sisters. Bike Boy cooked me dinner tonight and I have not washed a single dish all day. Now I'm going to go snuggle with my husband on the couch. That'll be a nice end to a mighty fine day. Oh, and thank you SO much to all those who sponsored me. You're very generous! I have learnt so much from you today. Like, be organised, get to the run early and slow runners are irritating. If I have to do a slow shuffle for the first km I will be soooo happy. Kathryn it's just my pathological fear of being late - and my control-freakiness. LOL. Deb, the GC marathon events are sure to be packed, so definitely expect a sloooow start.